Despite a dreary, overcast day at Cape May today, there has been plenty of activity in both birds ands birders this past 24 hours! Perhaps most obvious has been the impressive Northern Gannet show off the point; I met up with Tom Reed at St Pete's this morning before work and when I got there he was just passing the 2,000 mark for his count of gannets passing out of the bay. Also obvious were parties of Ruddy Turnstone and Purple Sandpipers moving between the jetties, groups of Dunlin heading north offshore and busy parties of Black Scoter singing their wonderful, mournful tunes. Tom's hilight of the morning was an early Brown Pelican that passed by a little after 7:00AM. Blue-gray Gnatcatchers have started to arrive now, the first being reported on March 28th, with others following daily since then. On 28th, Tony Leukering noted a Short-eared Owl at Stipson Island Road and a Cattle Egret was reported by Chris Vogel at the South Cape May Meadows; an American Bittern was also at the meadows the same day and one had been seen at the state park on 27th. Swallows continue to dribble in, with a Bank Swallow noted on 29th, and two Northern Rough-winged Swallows and 15 Purple Martins at the state park on 31st. An American Kestrel has been hanging out on New England Road/Bayshore Road for a few days now and the female Dickcissel continues to appear intermittently at the Northwood Center feeders. A Palm Warbler was one of the highlights of the first Higbee Beach Friday walk of the season on 30th, along with a small northward movement of Great and Snowy Egrets and three Blue-gray Gnatcatchers. Migration often produces occasions where birds are found 'out of context', and my latest experience of such an event was certainly a surprise. Out on the barrier islands last weekend, looking at plants around the edge of a soccer pitch in Sea Isle City, I was not surprised to note 10 Brant feeding out on the center circle in the middle of the field - but I was very surprised to notice a female Wood Duck hanging out with them! At this time of year, you have to keep an open mind!! 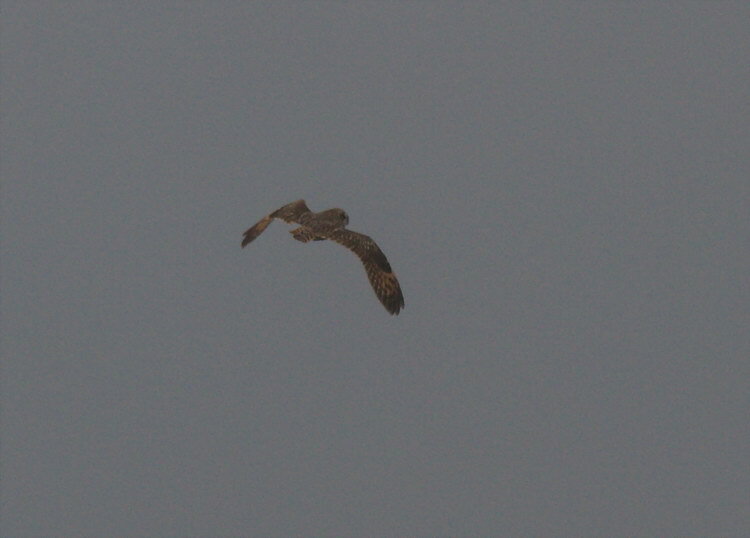 Short-eared Owl at Stipson Island Road, photographed by Tony Leukering. It has been a good long while since an installment of this irregular feature here, but it is now bug season! In addition to the pesky ones now coming out (mosquitoes, ticks), there is an untold host of non-pesky, perfectly interesting critters becoming available for ogling. 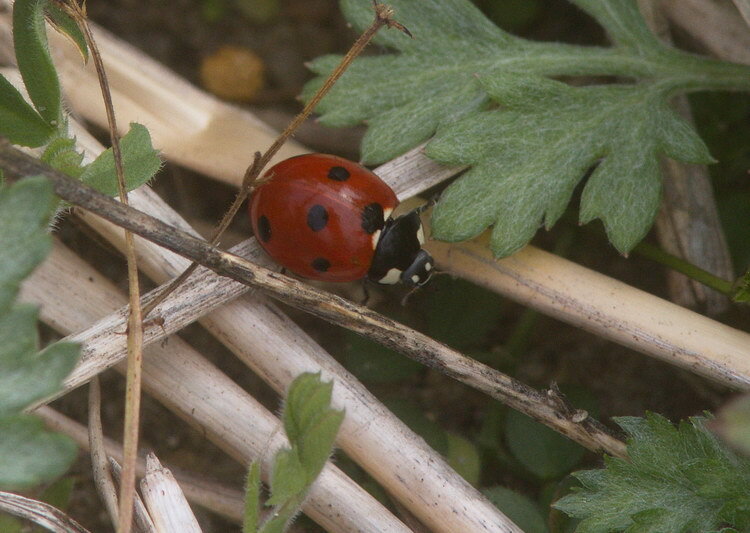 This week's bug is the Seven-spotted Ladybug (Coccinella septempunctata). This wee beastie is seemingly everywhere right now, emerging from winter dormancy earlier in March. 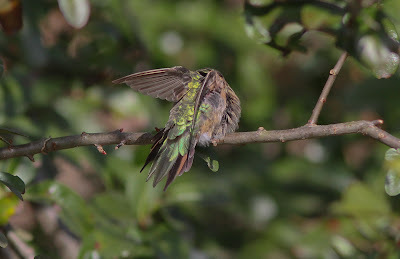 It derives its name from the seven spots on its elytra (singular, elytrum; English: wing covers), three on each, with the seventh at the top of the connection of the two elytra. It is yet another import from the Old World (along with a host of plants, including the one in the background, Common Mugwort), being widely introduced as a control of aphids, a food source that both larvae and adult find most palatable. It is so widely introduced on this side of the Pond and so appreciated for its destruction of aphids, that it has been proclaimed as the state insect of six US states! Here in the New World, it may be out-competing native species of ladybugs. Conversely, there is some indication that it is being out-competed in Europe by an Asian introduction, the Harlequin Ladybug (Harmonia axyridis), a species that has also been introduced into North America. After more than a week of fog-reduced visibility, we had some concerns for the effectiveness of the annual spring jaunt across Delaware Bay on the Cape May-Lewes ferry, this year on 24 March. Additionally, rain was in the forecast, and it had drizzled a bit before we all got to the ferry. But, the weather gods smiled on us, or, at least, didn't frown, and Karen Johnson, Janet Crawford, and I led an inveterate group of eight participants on what is probably my favorite annual CMBO field trip. On a typical ferry crossing, the most-interesting events often occur in Delaware waters over the deeper channel carved by the Delaware River at much lower ocean levels. 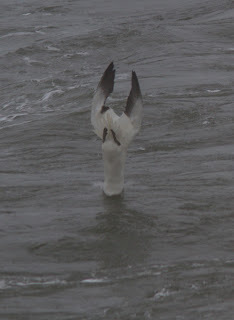 However, this time, most of the best birding was in Cape May waters. Things began with very poor looks at two Purple Sandpipers among six or so Dunlins flying from one jetty to the other that had the audacity to land on the wrong side of the jetty as we exited the Cape May Canal. However, whatever feelings might have been hurt by such rude shorebirds were quickly forgotten, as we shortly got into the best scoter show that I have ever witnessed from the ferry. In essence, Surf Scoters were nearly everywhere, sitting in groups of two to ten or so, and picking up and moving on as the ferry plowed its way south to Lewes. Though the participants could not discern the state line in the water, the scoters apparently could, as their abundance declined precipitously as we crossed into Delaware. We estimated that we had passed within sight of some 15,500 Surf Scoters, joined by fewer than 1000 Black Scoters. Though bird numbers were considerably smaller in Delaware, the diversity was a bit higher. Four cormorants perched on the markers and isolated rocks were identified as probable Great Cormorants, based mostly on the fact that all cormorants that I've seen there previously at this season have been Greats. The two perimeter walls hosted a large number of Double-crested Cormorants, with two Great Cormorants seen better (not much, but some) than the ones on the more-isolated bits of rock. Karen picked out two Barn Swallows while most of the rest of us were still ogling cormorants. The nest on the tower on the harbor wall hosted two Ospreys and a third Osprey was seen in the vicinity. During lunch while sitting in the Lewes dock, some of us watched an east-bound flock of Brant, a single American Oystercatcher standing on the wall, and cavorting Buffleheads and Red-breasted Mergansers. Our north-bound trip was a bit tame until a bit after crossing into New Jersey waters and passing the southbound ferry. 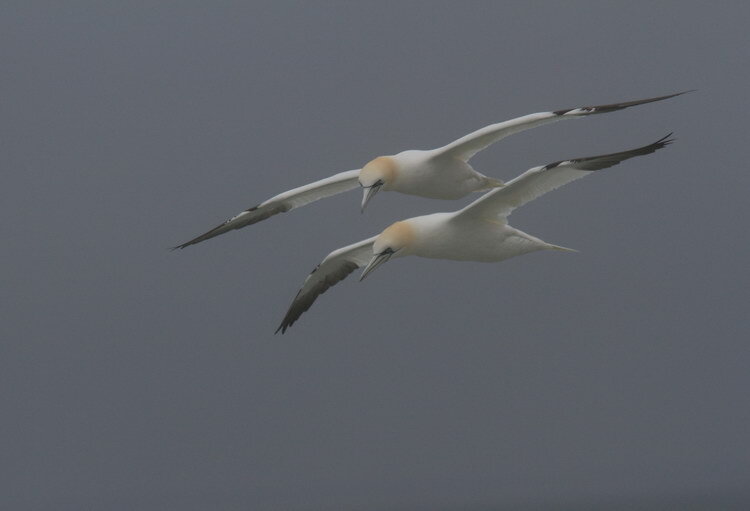 As expected, the Northern Gannets following that ferry crossed over to ours to hitch a ride on our ferry's slipstream back to the north. 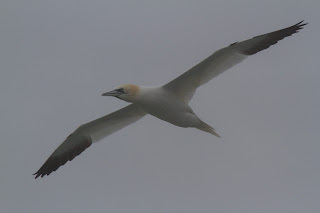 However, unlike on our southbound leg, Northern Gannets kept arriving from points east and west until we had our second spectacle of the day, and the one that I usually expect in spring. At some point, the ferry passed into the mother lode of baitfish, and Northern Gannets started diving into the wake after them. Of course, once one has a suitable number of gannets behind the boat, they start talking to each other anytime there is a fish in the offing. 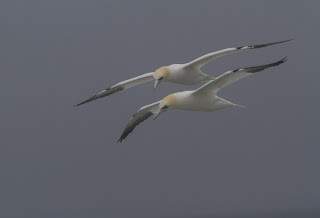 And, of course, once that starts happening, even more gannets begin arriving to take advantage of the feast. Can you discern the nine Northern Gannets in this picture, even though some of them are not visible? I don't know that any of us spent any significant time on the rest of the crossing looking at anything other than the gannet spectacle. All good things come to an end, and too soon, our trip was over. However, during our entrance into the Cape May Canal, we finally scored Bonaparte's Gull and Forster's Tern, nine of the former exiting the canal past us, and one of the latter standing on the beach to the north of the north jetty. Checking the weather radar on my phone after getting to the dock, we could see the next band of showers coming north up the Bay, the same band that we could look up from the phone and see by looking south. Great timing! On Monday, March 26th, two men, two Cape May birders, put themselves on the map for two very different reasons. Both are either wizards or wise men - you can decide which (and bear in mind that they might be both for all I know!) Alan Brady made the news, for it was his 92nd birthday. Alan has been a mainstay of New Jersey birding for more years than I am sure he would care to remember and he is still a regular face at the Northwood Center store. His name appears on many a rare bird find in the New Jersey archives and he has spent countless hours at sea, photographing and researching seabirds. Many have learnt a lot from Alan so he is clearly a wise man, but he is a wizard too, since I saw him just a couple of weeks ago when he just happened to venture down to Cape May in time to see the Broad-tailed Hummingbird - a great skill if you can acquire it! Happy Birthday Alan! Warren Cairo took up on Pete Dunne's words of wisdom and checked out Cape May Point after our monday morning Meadows walk - and stumbled straight on to a Swallow-tailed Kite!! The bird roamed around as far as Stevens Street and The Beanery for almost exactly an hour before doing what they always do - disappearing into thin air. Another remarkably early event to go with all the others so far this year. Going all the way back to 21st, Karen and Brian Johnson reported two Whip-poor-wills calling at Jake's Landing Road and Brian reported a Yellow-throated Warbler back on territory at Bear Swamp, Cumberland County on 22nd. The following day I heard one singing at the Northwood Center but couldn't locate it before it moved on. Yellow-throated Warblers continued in the news with Tom Reed counting 24 singing birds around Belleplain on 24th and 108 Pine Warblers logged on the same route. Also in the news are Ospreys, with our very own Cape Island Creek birds back on their nest platform on 23rd and more being noted throughout the county daily. The CMBO Poor Man's Pelagic went off superbly despite the worry that fog would ruin the day. In the event, the weather cleared enough for participants to enjoy thousands and thousands of scoters out on the waters of Delaware Bay, while dozens of Northern Gannets fished in the wake of the ferry and a Tricolored Heron was added as a nice bonus. 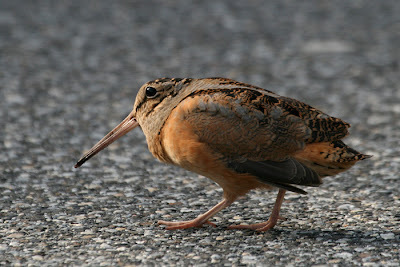 An American Bittern was reported by Tom McParland at Cox Hall Creek on the evening of 25th and the same day saw a flock of 22 Glossy Ibises flying over Cape May Point. Also moving now - Golden-crowned Kinglets and Cedar Waxwings are plentiful out on the barrier islands it seems, though not so obvious around the point. I found plenty of both species out there on Sunday, including a flock of around 90 Cedar Waxwings in a Red Maple in the streets of Avalon. Male Boat-tailed Grackles are noisy and obvious as they sing and display to their partners out there at the moment too. A Common Yellowthroat was at Turkey Point, Cumberland County on 27th and a Common Goldeneye remains at Heislerville. Occasional reports of both Orange-crowned Warbler and Yellow-breasted Chat at the state park still filter through with the former currently last noted on 24th and the latter on 19th. A Blue-winged Warbler was reported from Belleplain SF on the exceptionally early date of 23rd and a Yellow Warbler was reported singing at Estell Manor Park on 24th. Both records await confirmation as fas as I know. Finally, a male Eurasian Wigeon is still hanging out at Corbin City impoundments. Migration under way - 22 Glossy Ibises winging their way over Cape May Point on Sunday [photo by Will Kerling]. Wayne May sent me this picture of a Killdeer which was already settling down on four eggs at Smithville in Atlantic County on March 18th. My regular Wednesday morning walks at Cape May Point started today - and how great it felt to be back out in the field and looking at Cape May's birds! While we were out there, much of our walk took place against a wonderful background sound of Black Scoter calling away out in the bay with their almost ethereal wailings. And that reminded me - our 'Poor Man's Pelagic' takes place this coming Saturday and I'll bet that this very same sound will be a background to that trip too. In past years, this program has given people a great opportunity to get some exciting close looks at a good range of seaducks, loons and - of course - Northern Gannets. 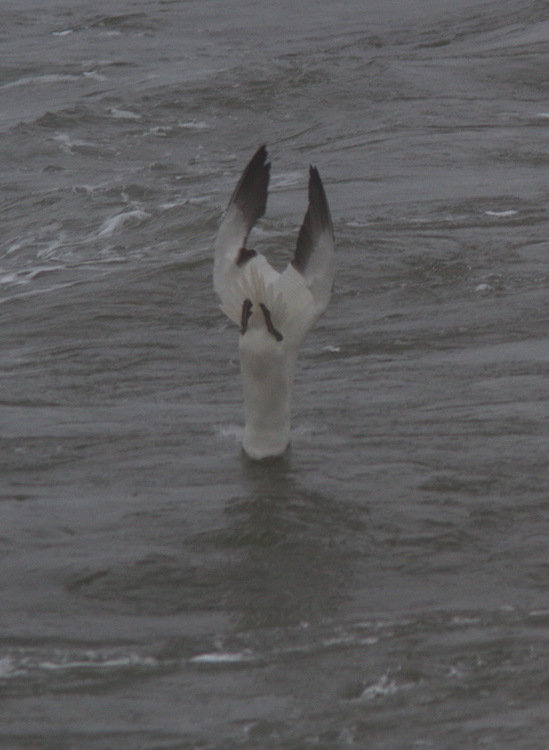 Indeed, right on cue, there has been some pretty good gannet movements already in the Delaware Bay and this is a great opportunity to pass right in amongst them. So what is the Poor Man's Pelagic? Well, it's a great opportunity to get out on a boat and look for seabirds without having to head way offshore, or be out overnight, or have an ever-so-early start. We cross the Delaware Bay on the Cape May-Lewes ferry and we take a good look at whatever is out there, often getting very close to birds that would otherwise even be beyond scope distance! Interested? Check out the details on our events calendar and give Chris Tonkinson a call! It's a great way to be far from the madding crowd and out enjoying birds! Our walk this morning revealed that the Glossy Ibis and two male Blue-winged Teal continue in the state park and we flushed four Wilson's Snipe as we made our way round the trails, so they are heading north now. Also heading north are Pine Warblers - in good numbers now. Indeed, after four days out of the office, I reckon by far the commonest topic of discussion in the emails waiting for me was Pine Warblers! They are clearly moving well now and many pictures were sent to me of birds at backyard feeders. 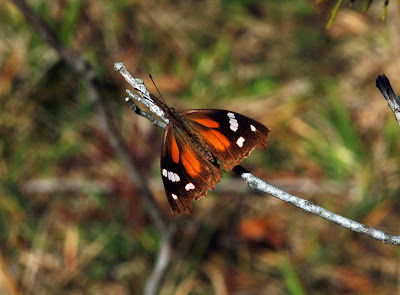 For a species that habitually arrives here from the south in mid-March, they need to find food wherever they can find it, since insects will still be in short supply. So you will often see Pine Warblers rummaging around on the ground for last year's fallen pine seeds, or taking seeds and suet from your backyard feeder! 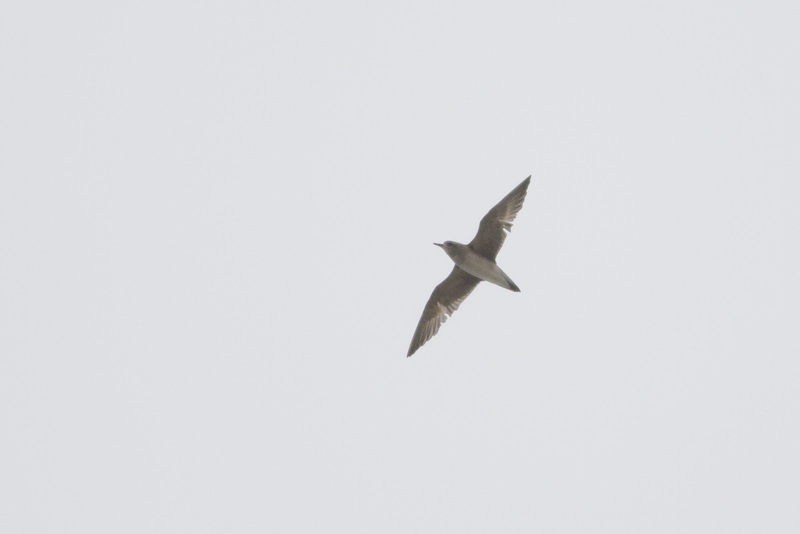 Also of interest over the past few days, Sam Galick reported a fly-over American Golden Plover at Cape May Point on March 18th. This is an exceptionally early date for Cape May and a species which remains a rare migrant in spring. Other shorebirds in the news include American Oystercatchers and Piping Plovers which now seem to be well and truly 'in' at South Cape May Beach (three pairs of the latter were present on 19th) and two Stilt Sandpipers which Harvey Tomlinson saw at Heislerville on 20th. A Wilson's Snipe was at Beaver Dam on 17th and Peter Bosak reported an immature male Common Goldeneye with Ring-necked Ducks on Hand Millpond off Rt 347. More 'first-of-years' include a Louisiana Waterthrush heard calling by Brian Johnson at the Mauricetown Causeway on 20th and a Blue-gray Gnatcatcher seen by Tom Reed in Cape May City today (21st). Pine Warbler eating backyard sunflower hearts [photo by Pat Sutton]. 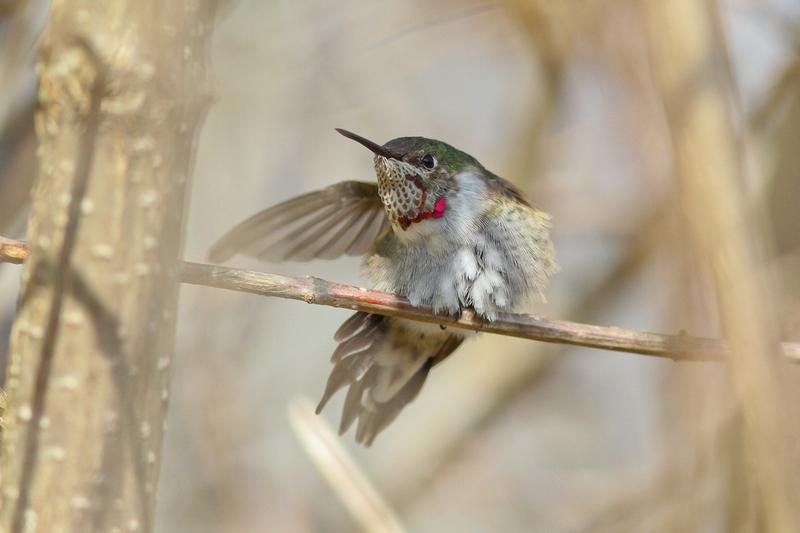 News of the Broad-tailed Hummingbird comes less frequently now with fewer visitors per day, but this photo taken by Hilary Sullivan shows that it was present to 18th at least and its molt is gradually advancing, with more scintillant throat feathers now present. An American Golden Plover over Cape May Point was a great find on 18th [photo by Sam Galick]. A spell of foggy weather, brought on by a settled high pressure system that dragged cold air in off the sea, caused a slight pause in good birding activity over the weekend, but Monday finally saw a return to glorious sunny skies and temperatures up in the seventies. Despite the fog, some interesting birds were around to be enjoyed, including at least one and possibly two Ospreys fishing at Lake Lily on Friday, the continuing Black-headed Gull at Miami Beach and intermittent reports of the Broad-tailed Hummingbird at Batts Lane. It seems that the latter was a little tricky over the weekend but I am not sure whether that was due to lack of observer coverage, the weather, or the bird changing its behavior. If sunny and warming weather continues, it is possible that it will decide to head off elsewhere shortly. 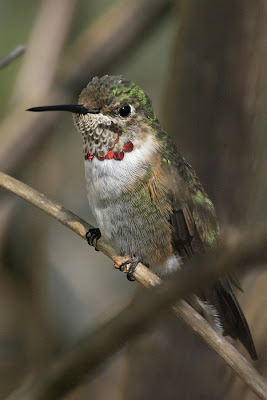 There have been no reports of the Rufous Hummingbird at Goshen for at least three days now so perhaps she has decided to begin the big push back to the breeding grounds; certainly hummingbirds are on the move now, with northbound Ruby-throateds already pushing their way along the Gulf Coast into the south-eastern states. Two Piping Plovers were reported from North Wildwood on 16th, reminding us that the barrier islands can actually be a great place to look for northbound migrants in spring. Tony Leukering and I had several Golden-crowned Kinglets, Tree Swallows and an Eastern Phoebe in the 'ghost town' streets of Ocean City recently and Karen Johnson reported a Palm Warbler at Sea Isle City on 14th. Participants on the first Loon Cruise of the season also enjoyed a nice range of birds, including at least four Great Cormorants which were hanging out by Cold Spring Inlet on 16th. Further afield, Tom Reed checked out the impoundments at Corbin City and found three Common Teal, a Eurasian Wigeon and three American Tree Sparrows there on 16th. The latter species has been particularly noticeable by its absence during this mild winter, presumably having chosen to winter further north. 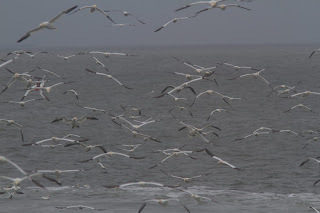 Coastal sea fog on 17th perhaps caused the first sizeable push of Northern Gannets into Delaware Bay, with Don Freiday counting 52 passing south off Norbury's Landing in just five minutes in the evening. The highlight on 18th was an American Golden Plover heard calling over the point by Sam Galick and three Lesser Black-backed Gulls were also on the beach there, while Bob Fogg found an Iceland Gull at Norbury's Landing on 19th. The warm weather meant it didn't take much persuading to get some of us scouring the north end of the county for other emerging spring wildlife on 19th. I hear that Pat & Clay Sutton notched the first Blue Corporal dragonfly of the year, while I managed the first Juvenal's Duskywing at Dennisville. Small numbers of Blueberry and Holly Azures, Henry's Elfins and Small (Cabbage) Whites are on the wing now and Josh Nemeth found a Fence Lizard out and about at Belleplain. An Eastern Phoebe was in song at Tarkiln Pond, Chipping Sparrows are singing here and there and Pine Warblers seem to be singing all over the place right now. If you go down to the woods today, you're sure to get a big surprise! Drive down Seagrove Avenue or Bayshore Road and you will suddenly find great vistas have opened up to you; views that you never knew were possible. Why is this? Well, it's all part of a drive to rid Cape Island of some of its most persistent alien invasive plants. Admittedly it looks pretty drastic at the moment, but the end result should be more natural habitat for wildlife in an area that really needs it. For more information on this work (and pictures!) go to our Conservation page by clicking here. Perhaps inevitably, I have been bombarded this past 24 hours by emails from people reporting earlier dates for just about everything I mentioned in my last post! This is perhaps inevitable in the new age of birding, where observers' sightings get scattered to seemingly ever more listserves, websites, blogs, texting services and databases, rather than coming through a single, local collection point. I hear that Pete Bacinski and Sandra Escala chanced across Deidre Asbjorn watching a Laughing Gull at Cook's Beach on March 3rd, so it looks like Deirdre gets the coveted LAGU Award! Tree Swallows seem to be trickling in gradually throughout the area with small numbers reported from several locations over the past few days. Great Egrets, Great Blue Herons and even the odd Snowy Egret have all put in a showing too; Jim Blumenstein mentioned a gathering of 25 egrets at Heislerville, while at least six Great Egrets and four Great Blue Herons were on Magnolia Lake in Seaville when I drove past there on Monday. Surely the first real sign of spring came with the first eye-witness report from the field of warblers arriving at the point. 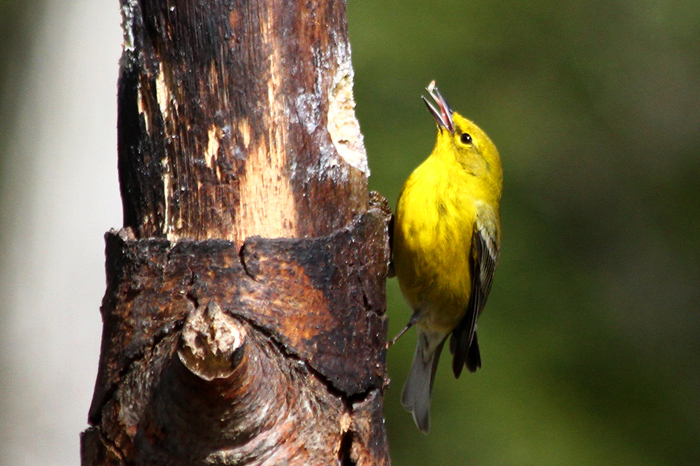 Tom Reed reported 21 Pine Warblers heading north at St Pete's in an hour on the morning of 14th. Yesterday also produced the first Holly Azure of the year for Will Kerling, an increase in the number of Orange Sulphurs, Small Whites and Mourning Cloaks and my personal first Green Darner of the year - though Jim Dowdell and Will Kerling have both had this dragonfly species this week too. Temperatures are now hitting the Seventies - it will soon be time to take a layer of clothing off! This Tree Swallow may only be just in, but photographer Joe Siekierski tells me that it was already laying claim to a box at the South Cape May Meadows and dusting up with the House Sparrows! Every year spring takes us through a rough ride of peaks and troughs; a hint of sun, the first Pine Warbler in song, then a day of cold wind and rain. 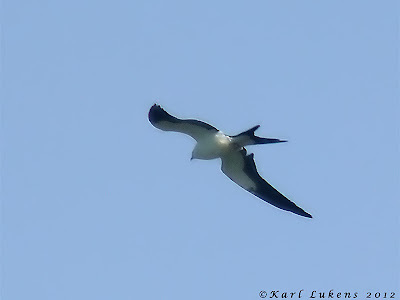 Another warm sliver of hope, three Laughing Gulls, then a chilly wind off the Atlantic Ocean! And so it has been this year. 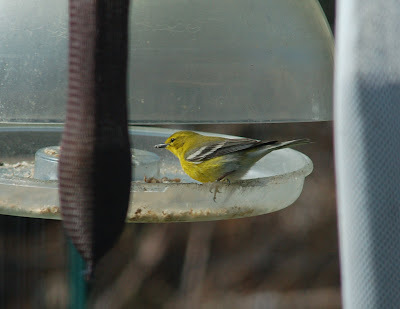 Winter remnants currently include an Orange-crowned Warbler which is being reported on and off at the state park still, while one at the Northwood Center on 8th was more of a surprise and perhaps an indication of birds starting to move around a little more. Ducks still crop up regularly in text messages and these birds are certainly heading north right now (just in time for our workshop on this very subject with Pete Dunne - click here!). While the commoner species are still present in good numbers at favored sites, oddities (for us at least!) such as Common Goldeneye and Common Merganser have cropped up recently and up to six Harlequin Ducks have been not far away at Atlantic City. The first real sign of a slow but steady advancement of the seasons is usually taken as the first report of Laughing Gulls at Cape May. 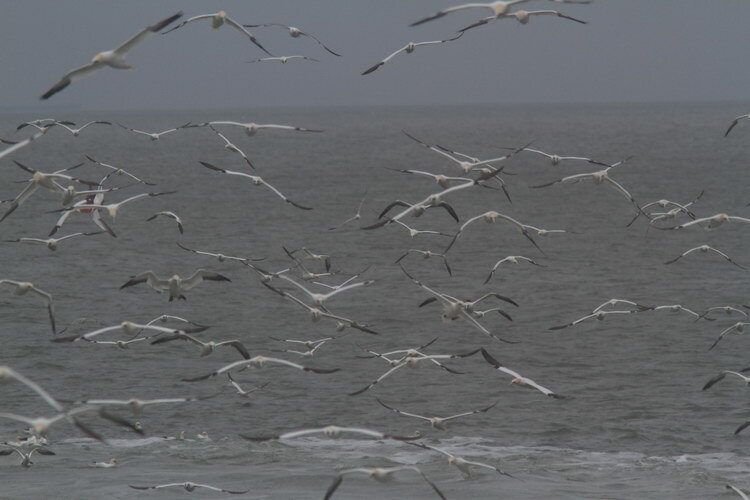 A light-hearted LAGU Award is put out to the finder each year, and this year it goes to Jim and Linda Waldie who reported three Laughing Gulls from Cape May Ferry Terminal on March 10th. 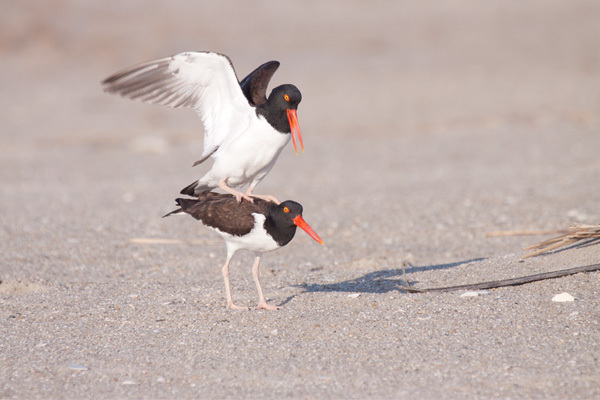 Perhaps the same three birds were noted off Miami Beach by Tony Leukering on 12th. The latter site still continues to host a Black-headed Gull which was last reported on 11th but is probably still in the area. Three Pine Warblers were singing along Jake's Landing Road on 8th and would appear to be newly-arriving birds. 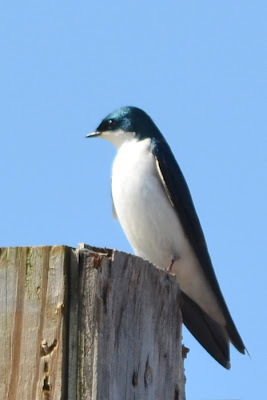 On 12th, at least six Tree Swallows and an Eastern Phoebe were in Ocean City. 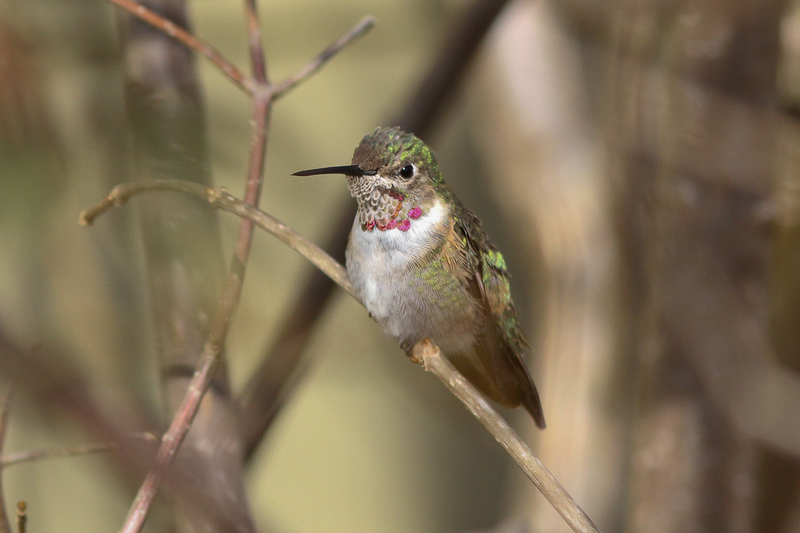 Our wonderful Broad-tailed Hummingbird remains at Batts Lane this morning, though I gather some people are having to wait quite some time for a showing. Perseverance should pay off however. 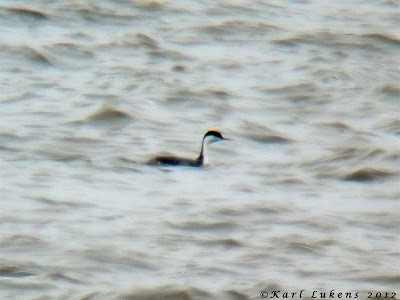 In contrast the whereabouts of the Western Grebe has become somewhat obscure. While I haven't personally heard of a definite sighting since last Friday, the waters have been a little choppy and there is a lot of loons around right now so would-be finders need to be very careful with attention to detail. No reliable pattern of movements has been shown by this bird, making it very hard to pin down, but we will let you know if it gets confirmed as still present. The female Dickcissel continues - rather elusively - at the Northwood Center feeders, while the female Rufous Hummingbird was still at our Goshen Center to the weekend at least (she seems to have been overshadowed of late by news from Batts Lane!!). Finally, for now, an Osprey was reported belatedly as having been seen last Friday (9th) which is about the right time for the first of spring, but this year there have been one or two winter records so it is hard to be sure. Cape May's butterfly watchers - with much assistance from the amazingly mild weather - continue to re-write the record books this year. Though some experts have suggested that American Snout could winter as far north as New Jersey, I don't think that anyone has actually proved it - until now. The unstoppable Jim Dowdell started the ball rolling with a remarkable find of one at the Cape Island Preserve on February 1st. Will Kerling followed this with singles on February 17th and 22nd near Beaver Swamp WMA. Just a few days ago, on March 7th, Pat and Clay Sutton then found the fourth snout for the year, at Woodcock Lane off Route 47, but Will Kerling blew the doors off it all on March 8th with a remarkable count of 14 at Beaver Swamp! With no other evidence of species arriving from the south in any quantity yet, it seems pretty certain that these individuals have overwintered as adults locally, the best evidence yet that this species can do so. American Snout at Woodcock Lane, March 7th [photo by Pat Sutton]. 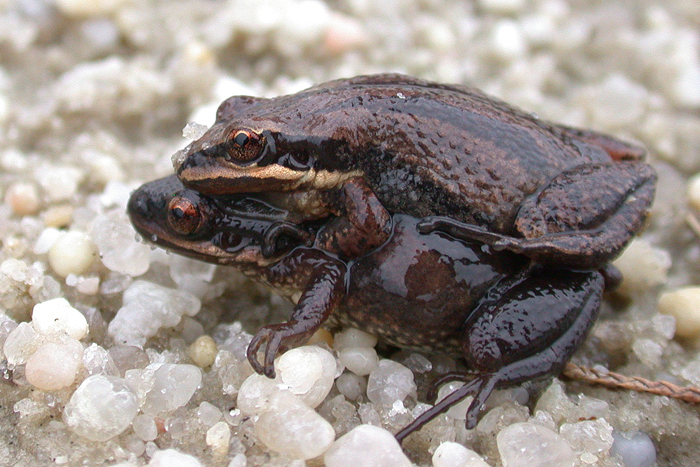 Mating American Snouts at Beaver Dam Road, South Dennis, March 8th [photo by Will Kerling]. Keep an eye out for Bald Eagles if you visit the South Cape May Meadows this weekend. 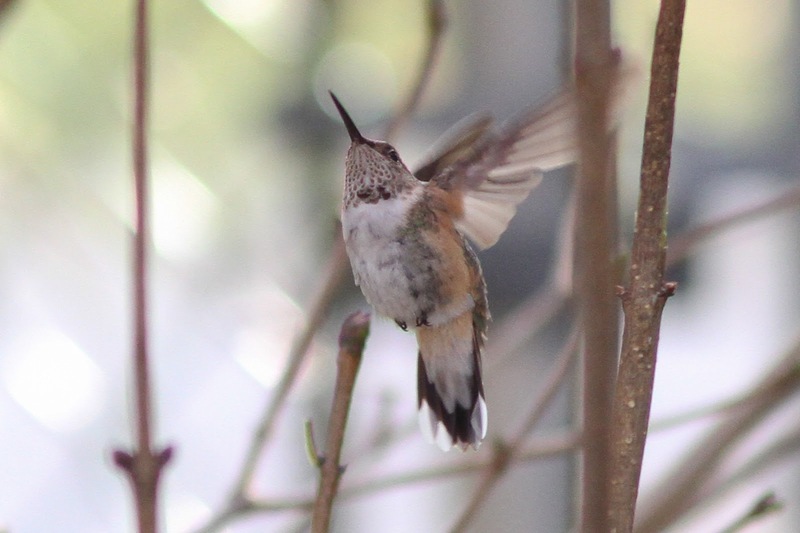 This adult has been hanging out there a lot lately and often gives great views - here photographed by Joe Siekierski on March 8th. Things that go beeep in the night - and cross the road! With temperartures edging upwards there's a sense of spring in the air and that classic combination of sunny spells interspersed with rainy spells has got the flower buds popping open and all sorts of animal activity going on. This time of year is particularly a time to be careful if driving after dark - for things are a-foot out there! This was brought home to me when I heard about last weekend's Woodcock Dance which sounded like they had an amazing time. Short-eared Owls and Northern Harriers parading right before the group, a singing Seaside Sparrow, then some wonderfully obliging woodcocks that displayed from right in the middle of the track. All fantastic stuff and hopefully all to be repeated this coming weekend. 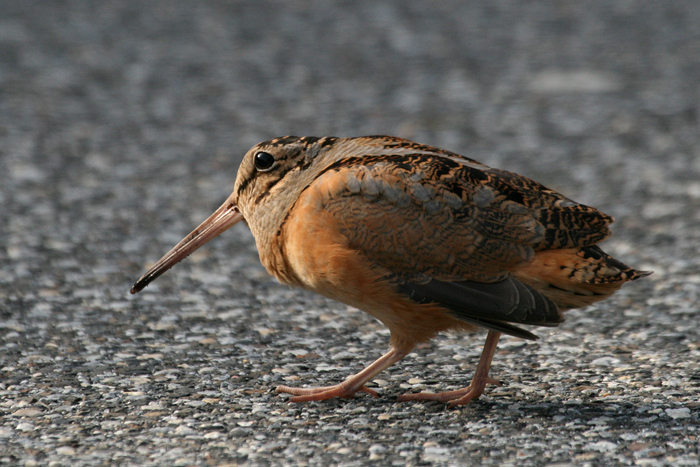 We still have just a few places left on this coming Saturday's Woodcock Dance program so don't miss out if you want a close encounter with the 'Timberdoodle' - call Chris Tonkinson on 609-861-0700 to find out how to take part. I mentioned driving after dark above and the main reason I did this is because we are rapidly heading into amphibian time. 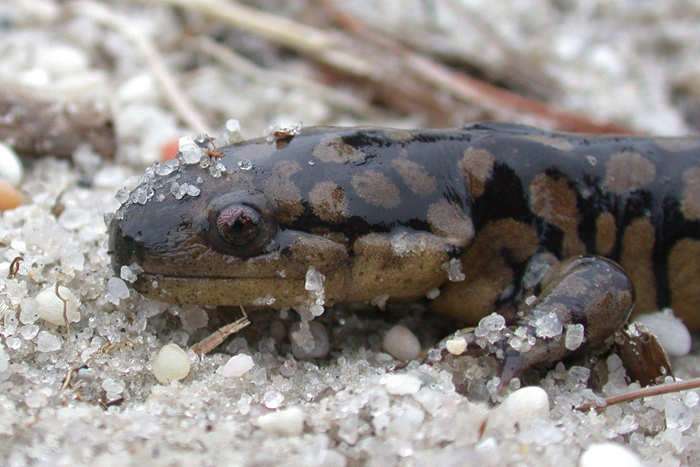 Over the next few weeks, our amphibian species will be emerging from winter hiding places and making their way to traditional breeding pools, some of which have been used for many generations. Amphibians most often move in greatest number on wet nights and their routes often take them across roads. So do please be alert to little guys weaving across the lanes and try to avoid them as best you can. Many of our amphibians are in steep decline due to habitat loss and the devastating effect on their populations of feral and domestic cats, so anything we can do to help will surely be appreciated by them. As of Monday, the Western Grebe was still keeping a little beyond decent viewing point - no news yet today but I'm guessing it's still around. It's very difficult to pin it down for anyone trying to see the bird; generally, on a falling tide it tends to drift out of the bay so is more likely to be seen around the end of the point from the St Mary's or St Peter's dune crossings. On an incoming tide, it can be as far north as the ferry terminal - as yet we have no reports from north of there. If you're not sure of the tide, or it's somewhere in between high and low, the best bet is probably to try Sunset Beach or Alexander Avenue. 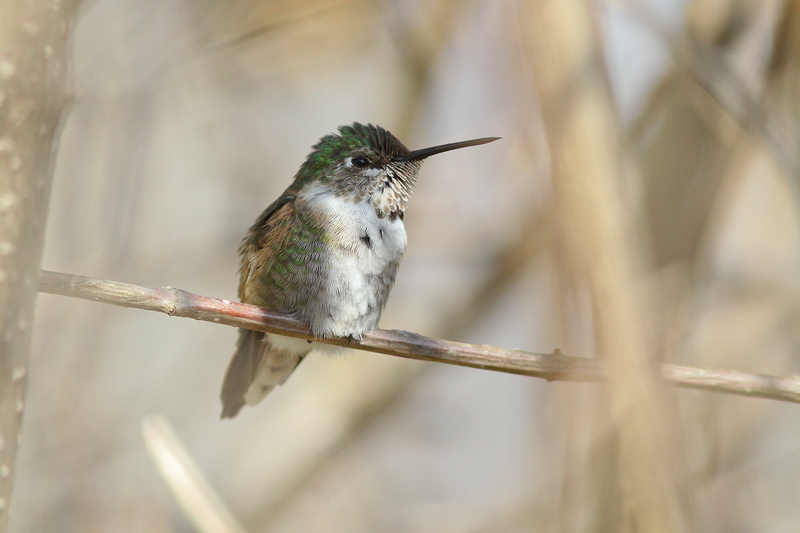 The Broad-tailed Hummingbird continues to delight visitors to Batts Lane and, despite drawing much attention, doesn't seem to have changed its routine much. It still remains faithful to the same perches in the hydrangea or firethorn bushes either side of the gate to the right hand side of the house. Other news this past couple of days headlines with an early return of Piping Plovers to New Jersey's beaches. Two were at the South Cape May beach on March 3rd, found by Warren Cairo and Claudia Burns, while Tom Wilson emailed me to report that one had returned to Absecon Inlet up in Atlantic County on 4th. American Oystercatchers are on the move too; although we get reasonable numbers wintering with us, many do head further south and there is a clear indication of movement right now with small parties being seen passing offshore or stopping off on the stone jetties around the point. Up to two Black-headed Gulls continue to visit Miami Beach at the north end of Villas and Dunlin, Bonaparte's Gulls and Forster's Terns can all be seen there in good numbers - probably best about an hour either side of high tide. The two male Blue-winged Teal (now looking very smart in breeding dress) continue in the state park, as does the Nashville Warbler this morning. One or two Eastern Phoebes have also been reported, though none seems to be hanging around for long; the latest was noted at Higbee Beach on March 4th by Don Freiday. Piping Plover - one of two on South Cape May Beach, March 3rd [photo by Warren Cairo]. 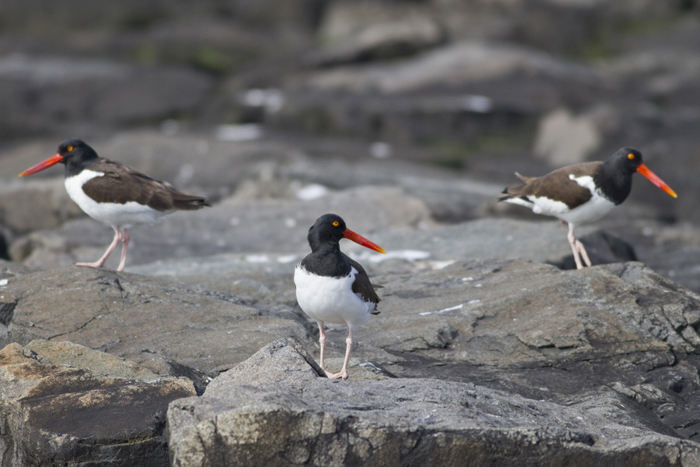 American Oystercatchers stop off at Higbee Beach jetty [photo by Sam Galick]. It's confirmed now! 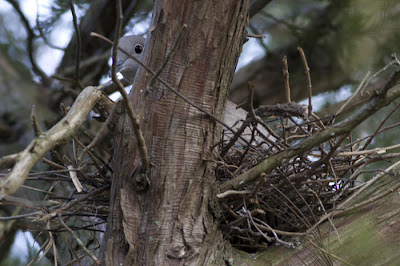 Eurasian Collared Dove on the nest at Cape May Point [photo by Sam Galick]. The Broad-tailed Hummingbird continues to show itself to visiting birdwatchers today and last night I was sent some more great pictures of the bird, so I'm sharing them here. All pictures are copyright of Michael O'Brien. The two pictures above were taken on January 7th and making an interesting contrast with what the bird looks like now. Note the juvenile tail with extensive white tips. It's easy to be right with hindsight and we can ponder on those broad outer tail feathers that rule out Allen's Hummingbird, but the green feathers coming though on the chest sides are flashing before me in my nightmares now!! If you are visitng this weekend, wrap up for some wet weather Saturday, but Sunday should be better. While you are here: the Western Grebe remains elusive but still present today off Sunset Beach/Alexander Avenue. According to tide (further north on in-coming, further south on out-going) it may be anywhere from St Mary's to the ferry terminal and usually anything up to a mile offshore (there's a lot of loons out there at the moment too!!). The Glossy Ibis is still at the South Cape May Meadows (Cove Pond end today), Lake Lily had Common Goldeneye and Redhead on Thursday, the Nashville Warbler was seen again at the state park near the small blind overlooking Lighthouse Pond. The Cackling Goose is still moving areound with Canada Geese, most recently on Shunpike Road near Stimpson Lane and two Horned Larks have been seen on the fields at the junction of Stevens and Broadway. With apologies for the late update - I started this post exactly eight hours ago but life has been a bit hectic today!! Mega news from Cape May! 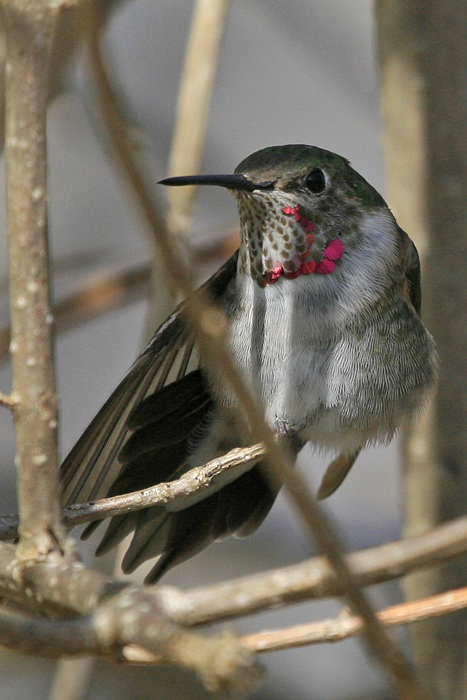 A male Broad-tailed Hummingbird is currently viewable at a private yard in Cape May. This will represent the first state record for New Jersey of this western species if accepted by the relevant committees. Thie bird is at a private feeder at 1026 Batts Lane, Cape May. The owner has given permission for birders to visit. The bird can be seen from the front lawn as it often sits in a hydrangea bush on the right hand corner of the house as you view from the road. The feeder is in the side yard to the right of the house. Please do not approach the feeder or the front of the house too closely and you should get views of the bird. IMPORTANT: Batts Lane is a narrow, residential street and the bird is right on a bend in the road. We strongly recommend that you park in nearby Shunpike Road and walk through (it is only about 150 yards). There is ample roadside parking on Shunpike Road. Please respect other local residents who may not understand the ways of us birders! 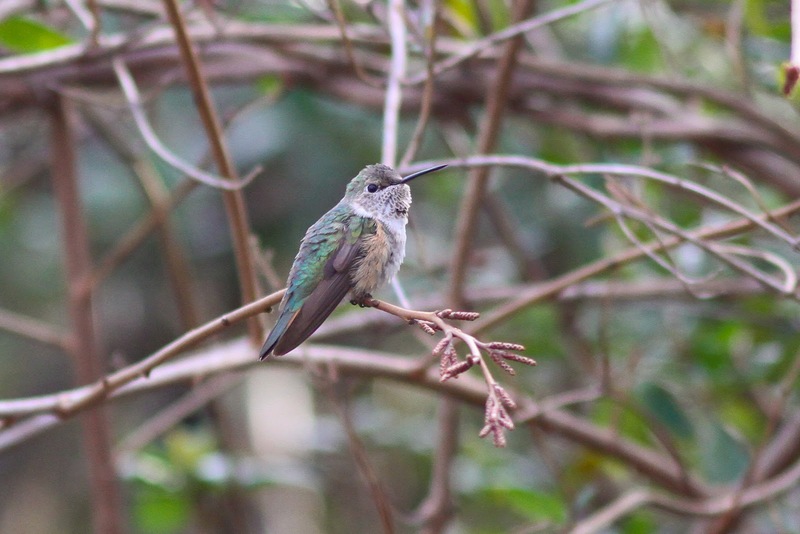 This hummingbird has been visiting a feeder in Batts Lane, Cape May since late last fall, but has been in juvenile plumage and was presumed to be a Rufous Hummingbird. Indeed, close inspection appeared to confirm that. However, the bird has now molted its tail which is conclusively that of an adult male Broad-tailed Hummingbird.